When research is speech, should it be regulated? Overall I think this sounds like mostly good news for social and behavioral researchers, if this actually happens. It’s possible that after the public comment period they’ll drop some of these changes or do something completely different. The HIPAA stuff makes me a little nervous. It appears that they are going to require the same level of security for a subject’s response to “Are you an outgoing person?” as for the results of an STD test. There also does not seem to be any provision for research where you tell subjects up front that you are not offering or guarantee confidentiality. For example, it’s pretty common in social/personality psych to videotape people in order to code and analyze their behavior, and later in another study use the videotapes as stimuli to measure other people’s impressions of their behavior. This is done with advance permission (I use a special consent form that asks if we can use videotapes as stimuli in future studies). Under the new rules, a videotape where you can see somebody’s face is considered fully identifiable and subjected to the most stringent level of control. Even just giving your own undergraduate RAs access to code the videotapes might require a mountain of security. Showing it to new subjects in a new study might be impossible. So I do have some concerns, especially about applying a medical model of data security to research that has low or minimal informational risks. But overall, my first reading of the proposed changes sounds like a lot of steps in the right direction. This is just what we need: scholars reading the ANPRM carefully and thinking about what its various proposals would mean for their research and teaching. Srivastava cares about the HIPAA restriction on "full-face photographic images and any comparable images"; other researchers will emphasize other details. Srivastava has also posted some thoughtful comments on the mortifyingly stupid CITI Program, including his frustrating correspondence with a CITI staffer who offered empty promises to revise misleading language. Thank you for the shout-out, Zachary. I have really appreciated your coverage and commentary, particularly the "Quick Guide" you just posted. 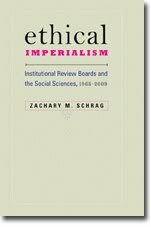 On the subject of the CITI course, you might be interested in an editorial my colleague Jennifer Freyd wrote for the Journal of Trauma and Dissociation, in which she criticizes the "McEthics" approach of CITI (if you follow the link, it's under the heading "Ethical Integrity in Research Also Requires Intellectuality"). Thanks for this comment and for the very kind words on your blog. Thanks also for pointing me to the Freyd editorial, which I will blog about soon. One of the reasons I began this blog is that thoughtful critiques of the IRB system were scattered among dozens of specialized journals, and no one was aggregating them. This editorial is a fine example, and I am delighted to publicize it. How Many Questions Must an ANPRM Ask? ANPRM: May I Be Excused? Will ANPRM Limit the Use of Published Data?